Thanksgiving is a time to be thankful for everything good in your life, and since all pets easily fall into this category, it is also a perfect time to show appreciation for them on this favorite holiday. The best Thanksgiving treats for dogs can be store bought commercial treats or homemade dog treats. 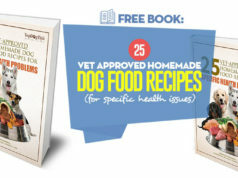 Just be sure to select ones that are healthy and safe for your canine companion. None of us pet parents want to leave our dogs out of the Thanksgiving feast. However, since Thanksgiving dinner is made of rich, fat foods, sharing your meal with your dog is probably not the best idea and can be dangerous for the dog. When you feed your Fido such human food, you are risking food poisoning or even pancreatitis. But there's a way to get your pooch involved in the Thanksgiving dinner anyway – safe and appropriate thanksgiving treats for dogs that will also be healthy for your pet. 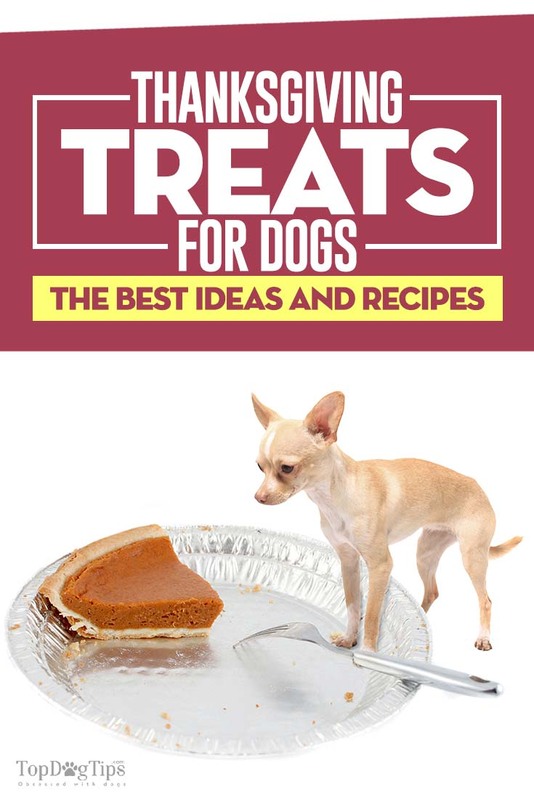 Most of the dog treat recipes below are easy to make and don’t require any special ingredients. In fact, you can probably make most of them alongside your normal Thanksgiving dinner. ALSO READ: Can Dogs Eat Turkey Meat? You want to surprise your pooch, but your cooking skills just aren’t that great, or you simply don’t have enough time to do it? There are some great dog treats for Thanksgiving you can find online and get your dog included in your holiday feast. The company is already famous for making some unique and tasty treats and foods for pets, and they're not missing an opportunity to give something to dogs on Thanksgiving either. These amazing Thanksgiving treats for dogs are made from fresh and completely natural turkey and cranberries, just like the traditional Thanksgiving dinner. They are also grain-free and include plenty of minerals and vitamins for the pup. It's a perfect after-dinner dessert for the dog – you don’t have to do anything at all except to serve Plato EOS Turkey with Cranberry Dog Treats, since they are already slow-roasted and ready to go. They are both healthy and delicious and your dog will certainly have something to be thankful for on Thanksgiving if you treat him with this sweet surprise. These chicken and peanut butter flavored Thanksgiving treats for dogs are completely organic and natural. One box comes with four homemade treats and your canine friends will love them, especially since they come in different sizes and shapes. You will get a drumstick, a pie, a turkey face and an orange nugget – basically everything you need to make your dog excited about Thanksgiving. Another important thing to know about Bubba Rose Thanksgiving Gobble, Gobble Dog Treats is that a portion of every purchase goes to various animal rescue groups. Not only will you be buying yummy Thanksgiving treats for dogs, you will also be helping animals all around the world. While this isn't actually Thanksgiving treats for dogs, it makes a great snack or food topper for your pet during the holidays. This delicious dog food is good for both adult dogs and puppies, since it is grain free and has no artificial preservatives, flavors and colors. It is made with fresh fruits and vegetables from the USA, and of course, fresh turkey meat. It's particularly useful for pet owners who don't have the time to cook Thanksgiving dinners for dogs and would rather use something premade. Merrick Classic Grain Free Thanksgiving Day Dinner Canned Dog Food is the closest thing you can find to the real Thanksgiving dinner in a can, since it has everything – sweet potatoes, green beans, apples, carrots, etc. If you want your dog to truly feel the spirit of Thanksgiving, give them this dog food. Turkey meat is a must-have tradition when it comes to Thanksgiving and your dog will surely love to enjoy some while the rest of your family digs in. When it comes to turkey dog treats, there aren’t any better than these superfood treats from Solid Gold. They are grain free and extremely tasty according to majority of dogs (or their humans, rather). They are made from natural ingredients and contain a great deal of nutrients while being relatively low in calories, so you don’t have to worry about your pooch becoming overweight or feeding him fillers if you give him these treats. 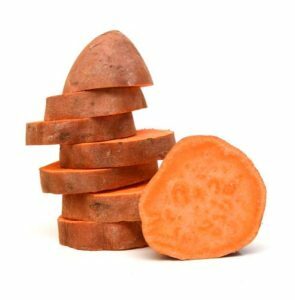 In fact, just looking at the ingredients, Solid Gold Superfoods Treats (Turkey and Sweet Potato) are likely to improve your dog's digestion and overall health. 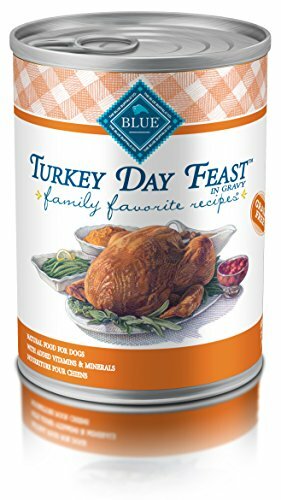 Not Thanksgiving treats for dogs, but this is another traditional Thanksgiving dinner in a can that is really delicious. With real turkey as the main ingredient, and fresh vegetables and fruits as others, this dog food is both tasty and healthy for your dog. Of course, there are no artificial colors, flavors or preservatives involved in making Blue Buffalo Turkey Day Feast Canned Dog Food. One smell of this food will make your pooch drool and after he is done eating, he will feel the real spirit of Thanksgiving for a long time. 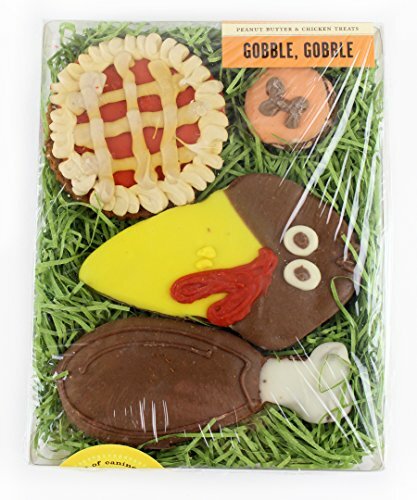 These tasty Thanksgiving dog treats come in a gift bag that includes 1 turkey biscuit, 1 turkey leg, and three fall leaves. That’s more than enough to make your dog feel happy about the turkey day holiday together with the family. These Thanksgiving treats for dogs are made with Honey Oat recipe and glazed with colored yogurts that give Woof Bakery Gourmet Biscuits with Yogurt Icing a truly beautiful look. These biscuits can be consumed at any time, but it is probably best to treat your dog to them right after the Thanksgiving dinner and only then, given that while they're delicious to dogs, it's best not to feed these on a regular basis. If you really want to surprise your pet and give him fresh and delicious Thanksgiving treats for dogs, all you have to do is follow our instructions and you will end up with a bunch of tasty dishes! These recipes are easy to make and don’t require almost any additional ingredients aside from those that you will be using for your Thanksgiving dinner. Turkey and cranberries are not just a traditional combination for Thanksgiving, they are also an amazingly good combination to make dog treats. Turkey is tasty and dogs love it, while cranberries are great for your dog’s health. If you are cooking the turkey for your dinner while you are making these Thanksgiving treats for dogs, then you can use the broth and you won’t need the oil. On the other hand, if you are using frozen turkey then oil is needed if you don’t want your treats to be dry. Start by preheating your oven to 350 degrees and greasing two cookie sheets. Then, you should mix the flour and baking powder in a bowl. Add turkey and egg into a blender with some broth or water if you need it and mix it until the turkey looks like baby food. Then you add cranberries and mix it all until the mixture is completely smooth. Add this mixture into the bowl and stir with the rest of the ingredients to make a thick dough that you will knead on a floured surface. Don’t use too much flour. Use cookie cutters to make the shape of the treats. Bake the treats in the oven for 30 minutes and serve them to your canine buddies after they have cooled off nicely. There is no Thanksgiving dinner without sweet potatoes and if you want your dog to enjoy them too you should make him these delicious treats. Start by preheating the oven to 325 degrees. Mix all of the ingredients in a bowl and make a sturdy dough – you may need to add a teaspoon of water if the dough is too dry or a bit more flour if it is too wet. Roll out your dough to make it half of inch thick. Use cookie cutters to cut dough into shapes and then bake them for around 10 minutes. Let them cool before you serve them to your dog. Pumpkin pie is another thing that is always served at Thanksgiving and you shouldn’t let your dog miss out on this sweet dessert. Additionally, pumpkin is full of fiber which is great for your dog, and it is also low in fat, so you won’t have to worry about his weight if you feed him these delicious Thanksgiving treats for dogs. Preheat your oven to 325 degrees. Use a medium bowl to stir the canola oil, peanut butter and pumpkin together, and use a large bowl to mix the following ingredients: flour, baking powder, oats, cinnamon, and ginger. Make a hole in the flower and put the pumpkin mixture in. Mix both of the mixtures together slowly, adding water in the process, until you make a sturdy dough. Knead the dough on a floured surface and then roll it to 1/4 inches of thickness. Cut the dough with cookie cutters and bake for around 10 minutes and leave the cookies in the oven for another 30 minutes after you turn it off. Let them cool off completely before you serve them to your dog. If you want to make your dog drool, making meatballs with turkey and sweet potato is a sure way to accomplish this. The first thing to do is to bake the sweet potato. Poke a few holes in it and bake it for 40 minutes in an oven preheated to 400 degrees. You can also microwave it for 10 minutes. Let it cool for a while after it is done. Pull the skin from sweet potato and put it into a big bowl. Mix egg and parsley in a blender or chopper and add it to the bowl with sweet potato. Add turkey, cinnamon, oats, and honey as well and mix it with your hands until it is combined well. Roll the mixture into balls and put it on a large cookie sheet that you will spray with cooking spray. Put it in the oven that you preheated to 350 degrees and cook it for 20 minutes. Let the meatballs cool off and serve them to your dog. All of these Thanksgiving treats for dogs can be stored in a refrigerator as well and served at a later date. So, don’t hesitate to make more of them now and treat your dog in the future as well.